We call it justice—the assassination of Osama bin Laden, the incarceration of corrupt politicians or financiers like Rod Blagojevich and Bernard Madoff, and the climactic slaying of cinema-screen villains by superheroes. But could we not also call it revenge? We are told that revenge is uncivilized and immoral, an impulse that individuals and societies should actively repress and replace with the order and codes of courtroom justice. What, if anything, distinguishes punishment at the hands of the government from a victim’s individual desire for retribution? Are vengeance and justice really so very different? 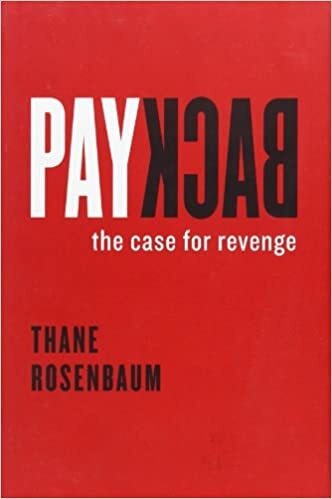 No, answers legal scholar and novelist Thane Rosenbaum in Payback: The Case for Revenge—revenge is, in fact, indistinguishable from justice. Revenge, Rosenbaum argues, is not the problem. It is, in fact, a perfectly healthy emotion. Instead, the problem is the inadequacy of lawful outlets through which to express it. He mounts a case for legal systems to punish the guilty commensurate with their crimes as part of a societal moral duty to satisfy the needs of victims to feel avenged. Indeed, the legal system would better serve the public if it gave victims the sense that vengeance was being done on their behalf. Drawing on a wide range of support, from recent studies in behavioral psychology and neuroeconomics, to stories of vengeance and justice denied, to revenge practices from around the world, to the way in which revenge tales have permeated popular culture—including Hamlet, The Godfather, and Braveheart—Rosenbaum demonstrates that vengeance needs to be more openly and honestly discussed and lawfully practiced. Fiercely argued and highly engaging, Payback is a provocative and eye-opening cultural tour of revenge and its rewards—from Shakespeare to The Sopranos. It liberates revenge from its social stigma and proves that vengeance is indeed ours, a perfectly human and acceptable response to moral injury. Rosenbaum deftly persuades us to reconsider a misunderstood subject and, along the way, reinvigorates the debate on the shape of justice in the modern world.